MANILA, Philippines (RELEASED)– The results of 'May 2018 Civil Engineering (CE) board exam' together with the list of passers, top 10 examinees, top performing schools and related announcements are available at this website as PRC released the results online four (4) working days after the last day of board exams. As announced, 2,738 out of 7,599 examinees successfully passed the exams. The May 2018 Civil Engineer licensure exams are administered by PRC Board of Civil Engineering headed by its Chairman, Engr. Praxedes P. Bernardo and its members, Engr. Pericles P. Dakay and Engr. Romeo A. Estañero on May 6-7, 2018 at PRC testing centers in Manila, Baguio, Cagayan de Oro, Cebu, Davao, Iloilo, Legazpi, Lucena, Tacloban, Tuguegarao and Zamboanga. According to the Commission’s Resolution No. 2017-1068 entitled “Schedule of Licensure Examination for Year 2018”, the target release date of May 2018 Civil Engineer (CE) board exam result will be in four (4) working days after the last day of board examinations or by May 11, 2018 (Friday). However, results may also be released earlier or later without prior notice. On the same exams conducted by PRC on November 2017, results were released after four (4) working days while during May 2017, November 2016 and May 2016, results were out after three (3) working days. The schedule of online appointment for issuance of Professional ID and Certificate of Registration will be from May 17 to June 5, 2018. Civil Engineering is one of the programs with huge number of examinees being administered by the Professional Regulation Commission. On CE licensure exams conducted November 2016, 5,036 out of 10,972 examinees passed. University of the Philippines (UP) and University of the Philippines - Los Baños (UPLB) got the first two spots in the top performing schools having 96.08% and 95.16% overall respective passing rate. Sirven Carandang Garibay from UPLB ranked first garnering 93.20% rating. He was followed by Samuel Eliezer Yu Uy and Selina Dianne King Bernardo, both from University of San Carlos having 92.75% and 92.65% ratings. On May 2016, 2,245 out of 5,882 examinees passed the exams. De La Salle University (DLSU) was the only school in the top performing schools list having 71 out of 88 examinees passed or an equivalent 80.68% overall passing rate. Luvincci Del Rosario Tan from Mapua Institute of Technology Manila ranked first garnering 93.70% rating. He was followed by Christian Espiritu Baldo and Rei Kevin Catantan Tungcab, both from FEU - Institute of Technology (formerly FEU - East Asia College) having 93.25% and 91.70% respective ratings. Meanwhile below is the statistics of Civil Engineering board exam results in the last four (4) years. 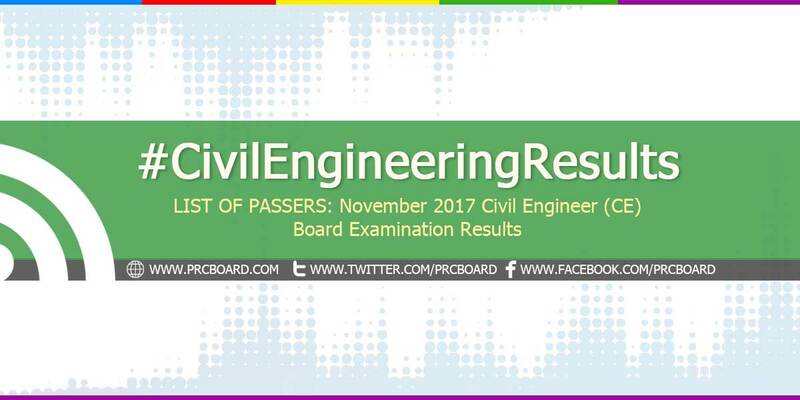 To receive up-to-date news on full results of May 2018 Civil Engineering (CE) board exams, we advise our visitors to bookmark and keep locked on this page, refer to PRC official website or follow us at our social media pages via Facebook and Twitter. Sana pumasa na yung kapatid ko. God Bless you all guys. Naniniwala ako, ... lalabas pangalan ko sa listahang to ng May 2018! In God's will and not my will. Go Lyka G.!! Congrats in advance!!!!! wohooo! Wohoo kilala ko rin to! Engr. na sya this day! haha mas excited pa ako kaysa sa kapatid kong nag exam. Lord sana po pumasa mga classmate Kong nagtake... Excited na ako para sa inyo! Engr. na kau mamaya! Hoping and praying to pass the exam! Thanks in advance G! Pasar na ak bskan wara pa result, in Jesus name. His way, his will and my faith take impossible things becomes real. Thank you lord engineer na ako. REGISTERED CIVIL ENGINEER NA KAMI!!!!! IN JESUS NAME. AMEN! Congrats to all of us. Ate GLAYDELYN S. GARCIA, aabangan ko name mo! !3 times na'ko nagvisit, wala pang result. Good luck & God bless sa lahat!!! Go mahal!!! I witnessed your hardwork and faith in God!!! Congrats my Engineer!! Sana pumasa ang kapatid ko, In the name of God...Pray pray pray!!! Sana pumasa lahat ng nagexam..To God be the highest Glory! Mathew 7:7 " He will deliver "
pumasa kna ngaun w GODS HELP. Mmya engr ka na. Congrats Nak. Go T.I.P. Manila Civil Engineering Department! To God Be the Glory.! Praying for all of you guys! Kinakabahan na si Lyka G.!!!! Nakakapuyat na ito. Sana pumasa ang kapatid ko, at good luck sa inyong lahat. Anuman ang resulta, hangarin ng Panginoon yan para s ikabubuti niyo. Go Shenna Divine Rombaoa Garbi! Go T.I.P. Manila! Congrats sa lahat ng pumasa lalo na sa kapatid ko Engineer JAYSON POTOLIN POSTRERO.thank you LORD dor the blessings..